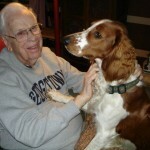 My father is 97 and I am very blessed to still have him in my life. In spite of failing eyesight and the mobility challenges of old age, he is always eager to visit. Today we will celebrate at our mountain cabin, where he loves the fresh air and being enclosed by the woods. 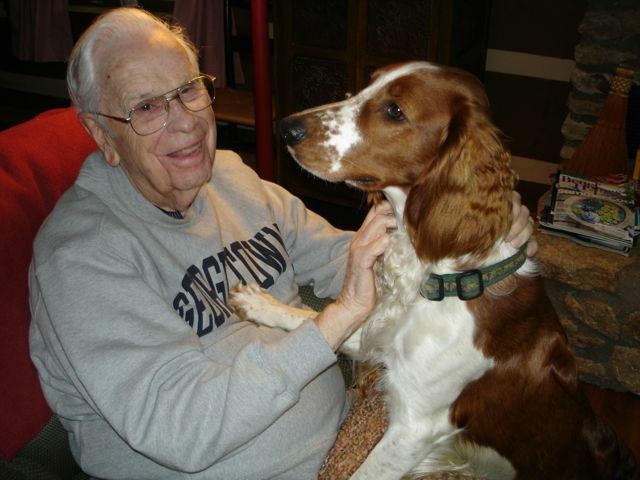 He’s always loved dogs, and as he sits in a rocking chair on the deck, there will no doubt be a spaniel on each side, getting a head rub. Here, he’s pictured with Alex. I treasure our time together.